Tim Mountz teaches agriculture and oversees the Westtown Farm. The Westtown School, which has been recognized for its educational excellence and student diversity, was founded by Quakers. There is a strong focus on stewardship, service and social responsibility. In keeping with these Quaker ideals, teachers Tim Mountz, Beth Pellegrino and Mitch Bernstein are dedicated to supporting local and natural agriculture. At Westtown, they’ve created a sustainable agrarian microcosm in which students play a big role. Students enjoying the fall harvest. When the student-farmer program began years ago, there were only three interested students. The number has swelled to twenty this year. In addition to working in the field, the student-farmers plan and run agricultural events such as a fall harvest and potato picking. “We recently held an event for one hundred people and the kids ran it flawlessly,” Tim explains. It's clear he is very proud of his hard-working students. In between the farm chores the kids find time to have fun. Everyone is enjoying the new outdoor wood-burning pizza oven. “It’s huge, it’s fantastic!” Mountz enthuses. Located adjacent to the farm, the pizza oven was the focal point of this year’s Earth Day celebration. All the pizza ingredients were grown in Westtown soil. “We pulled garlic right from the garden,” Mountz says. “The crusts were made from Pete’s Produce flour,” adds Pellegrino, the food service director. All of the crops grown by the student-farmers make an appearance in the dining hall. When meals include local and naturally raised meat and locally grown organic produce, they can’t fail to please the most finicky eater. There are always vegetarian and gluten-free options available. Westtown also boasts a scratch kitchen, meaning no processed baked goods are served. Everything is made from fresh ingredients. 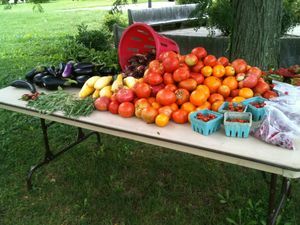 Summer offerings at the Westtown farm market. She radiates excitement when speaking about feeding the school community. “We are a conscientious kitchen,” Pellegrino explains. “We’re respectful of using as much local and naturally grown food as possible.” Feeding 700 people a day is a huge undertaking, especially when you are giving them a farm to table experience. It’s a priority to use the vegetables grown by Farmer Tim, as well produce grown by Peter Flynn, of Pete’s Produce, who farms 200 acres of Westtown land. “Everything that Tim and Peter grow, we say 'bring it in, let’s make something amazing,'” Pellegrino says. Pellegrino also purchases food from organizations that support sustainable agriculture, such as Lancaster Farm Fresh Co-op and the Common Market. In addition to the kids who wander into the kitchen, Beth has student help to prepare meals. Mitch Bernstein is Westtown’s Work Program and Service Coordinator. To assist Pellegrino, Mitch has created vegetable prep crews as a work rotation. The kitchen crew performs service work. This year, there are 18 different languages spoken by the student body, and despite cultural differences they all work side by side to keep the community thriving. Westtown recently won a $5,000 launch grant from The Campus Kitchens Project. Bernstein read about the opportunity and shared the idea with a student outreach director, who agreed it was a worthwhile endeavor. Campus Kitchen empowers students to fight hunger in their communities. 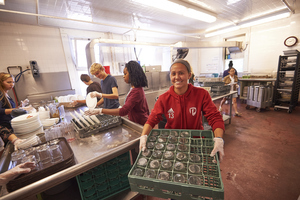 Students re-purpose leftover food from their dining hall and from community businesses. They then deliver it to organizations that feed the hungry. To win the grant, the students had to create a compelling video explaining how they would implement the Campus Kitchen, and the need for it in their local community. The winning school was then picked based on the number of votes each video received. Westtown was competing with a college in Kentucky for one of the grants. The entire student body spread the word through email, Twitter and Facebook, and kept the votes coming in. “The support was amazing,” says Bernstein. Using a portion of the grant money, cherry trees were planted. “Cherries are the quickest fruit to grow, easy to harvest, and are least affected by pests,” explains Mountz. In addition to the fruit and the leftovers, Westtown’s nutritionist will offer healthy food education and cooking demonstrations to the seniors. The school also has a long-standing relationship with City Team based in Chester, and through Campus Kitchen will continue to provide food to the organization. What would a farm be without chickens? Westtown has petite poultry farmers who start raising chickens in first grade. 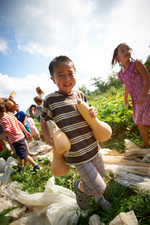 At the lower school farm, chickens entertain and educate, while the students do all the hands-on work. Mountz is also giving the middle school a chance to play in the dirt. “The sixth grade is studying composting,” he explained. “They take all the farm residue and the prep scraps from the kitchen and create compost.” Turning waste into soil, they monitor heat, pH and moisture levels. "When you take the screen off the wheelbarrow, the kids can’t keep their hands out of it,” Mountz said. “It’s such a beautiful thing. Looking to master new farming techniques, Westtown students are now learning about aquaponics. A Westtown alumnus with assistance from the design engineering class built an aquaponics system for the school. Consisting of two grow tanks and two fish tanks, the students are currently growing basil and kale. Eventually the fish tanks will house Tilapia and Sunfish.